A historical drama set in Roman Egypt, concerning a slave who turns to the rising tide of Christianity in the hope of pursuing freedom while falling in love with his mistress, the philosophy and mathematics professor Hypatia of Alexandria. Davus: I was forgiven but now I can't forgive. Ammonius: Forgive? Who the Jews? Davus: Well Jesus pardoned them on the cross. Q: When did the Roman Empire split in two? Q: What was the instrument that Orestes played to woo Hypatia? Spectacular and lavish film well directed by successful filmmaker Alejandro Amenabar . 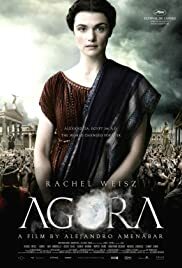 Historical drama concerning a slave (Max Minghella) who turns to the rising tide of Christianity in the hopes of pursuing freedom while also falling in love with his master, the known female philosophy and mathematics professor Hypatia of Alexandria (Rachel Weisz) .The mathematician and philosopher Hypatia of Alexandria was the daughter of the mathematician Theon Alexandricus (Michael Lonsdale). She was educated at Athens. Around AD 400, she became head of the Platonist school at Alexandria where she imparted the knowledge of Plato and Aristotle to any student. The picture is set in Alexandria, 391 AD . There Hypatia teaches astronomy, mathematics, and philosophy. Her pupils included pagans, Christians , slaves (Max Minghella) and foreigners . As the city's Christians, led by Ammonius (Ashraf Barhom) and Cyril (Samir) , gain political and economic power . 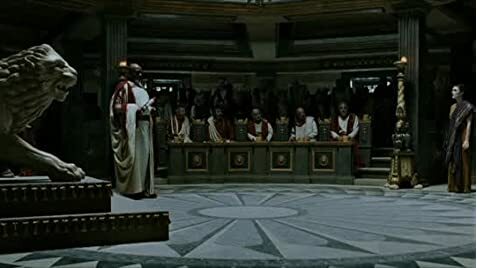 At the end Orestes (Oscar Isaac), the governor of Alexandria, and Cyril (Sami Samir) , the Bishop of Alexandria, found themselves in a bitter feud in which Hypatia would come to be one of the main points of contention . The feud, which took place in 415 AD, began over the matter of Jewish dancing exhibitions in Alexandria . Since these exhibitions attracted large crowds and were commonly prone to civil disorder of varying degrees . Then was published an edict which outlined new regulations for such Jewish gatherings . Soon after, crowds gathered against Jews and these angry over the new regulations that had been imposed upon them , which many people felt was an attempt to incite the crowd into sedition . This intense drama is based on some hokey events , on a hand there are real deeds , but on other hand based on false facts ; as Christians are the bad guys when actually by that time Catholics were relentlessly pursued and massacred . A historical, epic film set in Roman Egyp with excellent acting , overwhelming set design , colorful cinematography by Xavi Gimenez , evocative musical score by Dario Marianelli and lavishly produced by Fernando Bovaira . Interesting and thought-provoking screenplay by Alejandro Amenábar and Mateo Gil , they wrote the script with Rachel Weisz in mind to play Hypatia, the lead character. Splendid performances all around and special mention to Rachel Weisz giving one of the best acting of his prestigious career . Originally, Alejandro Amenábar wanted Rachel Weisz, Sacha Baron Cohen and Jonathan Rhys Meyers to appear in the film. After reading the screenplay, Weisz did accept the part of Hypatia, however, Baron Cohen turned it down . 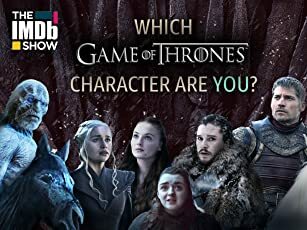 Along with a notorious remaining cast such as Max Minghella as Davus , Oscar Isaac as Orestes , Ashraf Barhom as Ammonius , Michael Lonsdale as Theon and Rupert Evans as Synesius . Impressive production design , as the sets were built on the exact same spot , Fort Ricasoli, Malta, where the Coliseum was built for Gladiator . The fort was also used for Julius Caesar, Helena of Troy and Troy . Breathtaking visual effects , as the FX team designed the night skies accurately for the time period of the movie using a star chart software. The picture is partially based on facts , as the texts written are varied : The contemporary 5th-century sources do identify Hypatia of Alexandria as a practitioner and teacher of the philosophy of Plato and Plotinus, but, two hundred years later, the 7th-century Egyptian Coptic bishop John of Nikiû identified her as a Hellenistic pagan and that "she was devoted at all times to magic, astrolabes and instruments of music, and she beguiled many people through her Satanic wiles". Not all Christians were as hostile towards her as John of Nikiu or the monks who killed her: some Christians even used Hypatia as symbolic of Virtue . Two widely cited, but divergent texts describe the feud between Orestes, the prefect of Alexandria and Cyril, the Bishop of Alexandria . The feud and the city-wide anger it provoked ultimately brought about the death of Hypatia .One source, the Historia Ecclesiastica was written by Socrates Scholasticus some time shortly after Hypatia's death in AD 415 . Scholasticus gives a more complete, less biased account of the feud between Orestes and Cyril, and the role Hypatia played in the feud that resulted in her death. The other source, The Chronicle, written by John of Nikiu in Egypt, around 650 AD, demonizes Hypatia and Orestes directly, while validating all Christians involved in the events Nikiu describes.